Don't let the word "poetry" scare you. There's a 100% chance that you'll connect with at least one of the 120 poems and stories in Band Nerds Poetry From The 13th Chair Trombone Player. 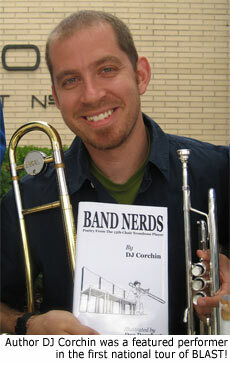 The engaging and unexpected book from DJ Corchin uses clever prose and perfectly matched illustrations from Dan Dougherty to celebrate the quirks of life in and around the band room. The book is filled with spot-on observations of sticky valves, squeaky clarinets, itchy uniforms and various other malfunctions that will bring former band members back to their glory days. There's also a dose of inspiration when Corchin reminds us that band is both a family and a launch pad for success. The book got its start while Corchin was performing in the first national tour of the Tony and Emmy award-winning show BLAST! He was in the cast for more than two years and was featured as the "unicycling trombonist." Corchin created an outreach program where he and six other cast members gave presentations about the show to student groups. The team also had the chance to share personal stories and answer questions. "I was able to speak to band students and directors all over the country from different walks of life," Corchin says. "Our message was that no matter where we come from, band is one thing that shows our similarities." Corchin started to assemble stories for a book after he found that his recollections of band experiences connected universally with current and former band students. Corchin is a big fan of poet Shel Silverstein, so he channeled Silverstein's fun and entertaining style. The resulting book is part memoir, part Saturday Night Live sketch. Don't worry if you were the squeaky clarinet, because Corchin gives equal time to flutes, tubas, guard and percussion. Corchin explains that his use of band stereotypes is meant to bring people together and to help laugh off the old tired image of being involved in music. "We can choose to let [stereotypes] shape us, or we can choose to write a silly poem book about them and laugh it off," Corchin says. I am the first chair. Everyone looks up to me. Passing music to the rest. Of all the 3rd part clarinets. Corchin is pleased that the book has received a warm reception, and he is currently working on a new book for younger kids. He has also written a new musical titled "Wings" that is currently in pre-production. Band Nerds Poetry is now available in paperback as well as the original hardcover edition (132 pages). For more information including excerpts from the book and videos featuring the author, visit The13thChair.com.